3. Syrup: we make it while we are baking the cake. 4. Put together sugar and water to a boil and let it dissolve well. 5. Add honey and let it boil for few more minutes (about 3 minutes). 6. Add the instant coffee the rum essence. 7. Let it cool thoroughly before you will soak the cake. 9. Butter should be at room temperature and the chocolate should be melted on boiling water bath or in the microwave (I kept it about 1 minute 40 seconds, checking it from time to time). 10. Mix the butter with an electric mixer, then stir in the melted chocolate (cooled). 11. My advice is to taste the cream first and if you think that needs more sugar, add more for your taste. I’ve put 3 tablespoons powdered sugar. 12. Add the cocoa and mix well. 14. Cut dough in two sheets and soak it with the syrup in abundance. 16. Meanwhile prepare the fondant (glaze). 17. In a double bottom saucepan, put water and sugar and let it approx. 15 minutes. 18. You must have a glass of cold water, beside you. From time to time (after about 10 min.) drip a little bit of syrup into the cold water, if it forms a hard drop like a pearl, then the the fondant is ready, let it simmer more if needed. 19. When the pearl test passed, turn off the heat and add honey. 20. Fill a saucepan with cold water to cool the fondant, or put cold water in the sink to cool it down. 21. Mix with a spoon until the fondant starts to thicken (becomes viscous), and white. 22. When becomes like that, add the cocoa and mix well. 23. My fondant has hardened a bit too much, so if this thing happens to you, add in 2 tablespoons of water and stir well. 24. Cut the cake into squares and pour 1 – 2 teaspoons of fondant over each piece. 26. Keep it in the fridge and when you want to serve, remove the cake from the fridge at least 20 minutes before, to be at room temperature. 27. Bon appetite! 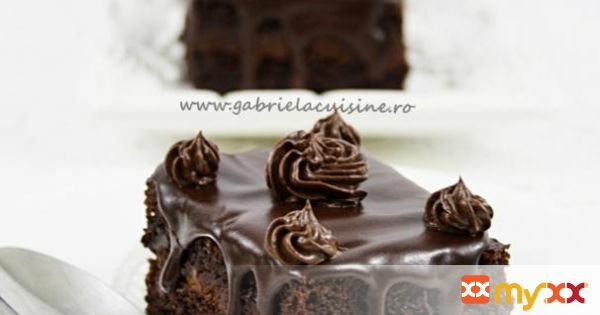 it is worth trying this awesome chocolate cake, is incredibly good!